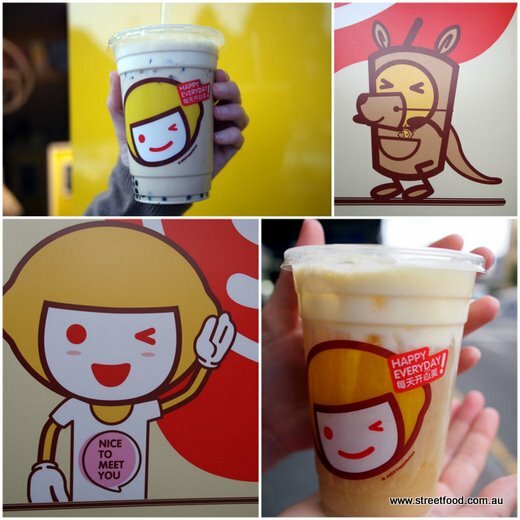 Happy Lemon is a drink chain from Hong Kong who has recently opened at Broadway. Happy Lemon is just so happy, check out their website. I don't understand a word of Chinese but is that the happiest website in the world or what? Happy they may be but it's the $1 drink special that lures us in. There were three $1 specials over three days. We missed day one but made it for day two, Milk Tea with Black Pearl Sago. It tasted much like the milk tea we had in Hong Kong only stronger, with lumpy bits at the bottom. The day three special we had to go back for: Green Tea with Rock Salt and Cheese. The main drink is a very strong green tea with quite a caffeine kick, this took some getting used to. The white frothy stuff on top was magic: the "cheese" tasted like cheesecakey cream cheese, the salt and sprinkle of green tea powder gave it an unusual edge. It wasn't love at first taste but we were hooked by the time we finished, it was very refreshing. We liked Happy Lemon so much we came back for more, this time we went for Matcha with Adzuki Bean and Pudding and Lemon Yakult Mousse Spin. Both were wonderful. Both $4.20. The "pudding" is lovely chunks of custard, yum. Back again - this time for the Blood Orange Black Tea with Aloe. It's incredible. A very strong black tea flavour goes perfectly with blood orange flavour. The only way to improve this is to add vodka. Happy Lemon is on Parramatta Road\Broadway out the front of the Broadway shopping centre, near Glebe. Ooooh you tried the cheese one! I was curious about scared at the sound of it! Was there on the 1st day and pleasantly surprised it was offering all drinks at $1. Will try the cheese one next...i walk by this place every day! Oh I love happy lemon and am so jealous they have opened in Oz! wish they would open one in UK! I'll have an extra salt cheese drink for you Lucy! I tried the matcha with adzuki bean and pudding ($4.20 for regular). Although not exactly a pretty drink, I was pleasantly surprised how strong the green tea flavour was and that the drink was not overly sweet. The pudding was pretty awesome as well (but looked like cubes of butter floating around my drink haha). It was also very filling! Hey Fred - you're right, the strength of the tea and the sparing use of sugar sets this place apart. We're only new to bubble tea, we've had some other bubble tea since this, it made me realise how good/unique Happy Lemon is. Isn't Happy Lemon place just amazing ?!?!?!? 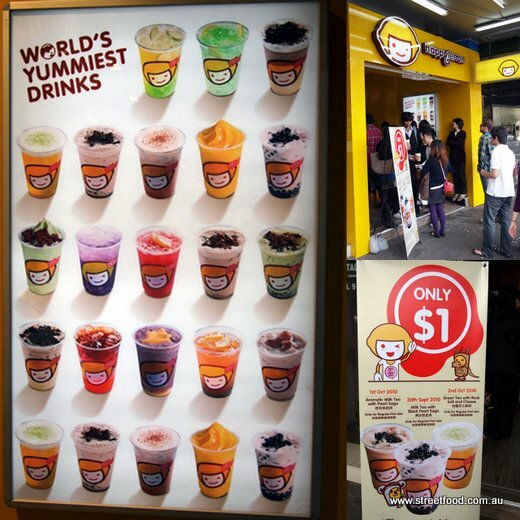 how is this compare to Easyway and chatime? I'm not sure Obesebaby, I haven't had much Easyway or Chatime, but I'm pretty sure the strong tea flavours and sparing use of sugar make Happy Lemon unique. Happy lemon is my favourite drink with its unique chesse green tea combination. In my opinion its better than the conventional EASYWAY many times because of its unique combination. can you ask for less sugar / no ice at HappyLemon like you can at Chatime? I tried the Pearl Milk Tea for $2 and forgot to ask for less sugar so it's a tiny bit too sweet for me. The tea taste is strong though. Comparable to Chatime, WAY better than EasyWay. Finally had my first Happy Lemon drink... yep, addicted. They had a $2 weekend special but both options were hot and it was far too warm today so I just went for good old pearl milk tea. Yum! Hehe - we were at Happy Lemon today enjoying the $2 weekend specials - yum!